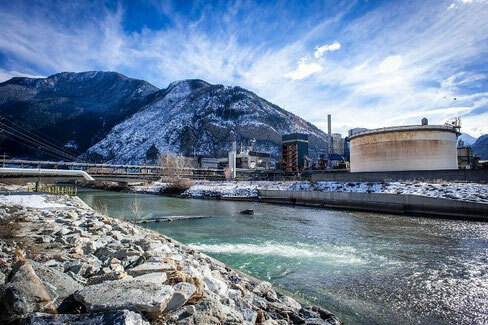 From swissinfo.ch (Keystone): Lonza plant and the river Rhone in the Valais canton in Switzerland. Tons of mercury were dumped into an evacuation channel between 1930 and 1973. The pollution was only discovered in 2010 during construction of a road. A Swiss consultant launches application geared to sustainability and joins the Brazilian former executive to give momentum to the design and conquer new markets. The mission of transforming the planet into a more sustainable place joined the Swiss consultant Matthias Müller and the Brazilian entrepreneur Telma Gomes on the same team. Müller is the application creator of the Sustainability Compass, launched in June 2014, which aims to stimulate smart thinking and sustainable attitude. Gomes is a partner in this project since late 2014. Among other activities, the Brazilian made the app translation into Portuguese. "Our goal with the application is to encourage the questioning and the search for answers to issues related to sustainability," said Müller, who enlisted the help of a group of collaborating friends and technicians. The app basically works presenting questions to users when they have to make a decision or manage any project, making a better assessment of the level of sustainability of their actions. society (e.g. dioxins, PCBs, DDT). The third principle supports the lifting of man's contribution to the progressive degradation and destruction of nature and natural processes (e.g., overexploitation of land and forests). And the latter refers to the elimination of collaboration of human beings to the conditions that impair the ability of people to fulfill their basic needs (e.g., working conditions, security and citizenship). Müller says that many of the app’s currently available on the market focus on actions and on giving advice to the user. On the other hand, end up disconnecting from people because they do not offer a more holistic understanding or a stimulus for questioning the individual. Just because it doesn’t offer ready answers nor it "makes it easy" for the consumer to take decisions, as proposed by most app’s, is that the Sustainability Compass can be a challenge as a project, explains Müller, because in the end, it is the user who makes the decision. in the application, it is set by the user, "says the consultant. In addition to knowing and believing in the potential of this methodology in the app, Gomes, a Brazilian who has lived for five years in Sweden, is part of the network of supporters of this proposal for sustainability. "The idea is to create an army for “the good”. Inspire people to have more awareness of how their thinking and actions impact the world we live in" she says. "We need to create new rules for the game, otherwise the planet cannot stand". In addition to Müller and Gomes, the team has an entrepreneur in Mexico. Currently the app is available in German, English, Portuguese and Spanish. And it costs 2 euros. It is available for iOS and Android systems. who send in comments and advice on how we can improve our service. In doing so, we learn that it is possible to establish many inspiring connections when trying to accomplish something useful. " president chair in that country. The Brazilian Telma Gomes has a long and solid executive career in various multinationals in Brazil. She moved to Sweden in 2010 to do a master's degree in sustainability and ended up settling her family there. In 2011, Gomes founded WIESD (Women at the forefront of Innovation, Entrepreneurship and Sustainable Development Program), a program to extend the role of women in leadership and facilitating their participation in innovation, entrepreneurship and sustainability. "This app is designed in such a way that the content is easily navigable, enabling you to play with it in fun ways." "Very interesting app. You'll find here everything about how to make positive impact on society, nature and people around you. The app has beautiful design and easy to use. Definitely recommend it." "Die App ist ein ästhetischer Leckerbissen und erläutert die Kriterien deiner Projekte mit Tiefgang. Unbedingt testen!" "The packaging of the app and the card deck is really smart. The questions gently help us realize that we want to live more sustainably - that it is important to us."